Nov 14, 2018: The Tata Ace Mega is like a heavy duty version of the Ace Gold and has better features on offer. First up, it has a higher gross vehicle weight of 2.1 tonnes, giving way to a better payload capacity of 1.03 tonnes. For the braking, there are disc brakes up front and drums at the rear. Though it has the same engine as the standard Ace, that is, a 0.8-litre motor, the power churned out is higher at 40 bhp and 100 Nm. For the transmission, there is a 5-speed gearbox doing the duties. Hence, it can be seen that the extra power and torque is given to carry more load on the deck. Super for transportation of goods ! Cost effective. Making transportation easier,smarter n better to any place with ease of driving n excel to perform better n making u to raise your business n your dreams high with profits.less maintaince ,better after sales service n brand Tata make it like true frnd for your business.with better mileage saves your cost on fuel giving more profits everytime.it d best pickup in india designed to generate maximum revenue to operator s.
Tata Ace Mega is a mega-powered mini truck and the heavy duty version of the Ace Gold. 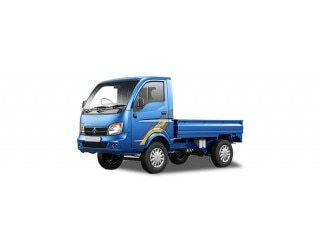 It comes with strong features and is aimed at providing a cost-effective solution in the SCV (Small Commercial Vehicle) segment in India. The speed, performance and reliability of this Ace Mega make it the perfect choice in in the present generation market. It is mainly made for business operations and serves as a market load operators across the country. The vehicle is offered in seven colour options. The Ace was first launched in May 2005 with “chotta hathi”. Over the years, it received modifications and a host of different variants. The Tata Ace Mega comes with a price tag of around Rs. 4.3 lakhs (ex-showroom) and is developed for increasing revenues of the operator by making more trips, more capability of load carrying and lower turnaround time. The vehicle can be easily driven on any kind of roads. The Tata Ace Mega is powered by a 0.8-litre DICOR (Direct Injection Common Rail) two-inline cylinder BS-IV compliant engine that can churn out a maximum power of 40 bhp at 3,750 rpm along with a highest torque of 100 Nm, which comes between 1,700 rpm and 2,000 rpm. The engine is mated to a 5-speed manual transmission with the help of a single plate dry clutch. The gearbox comes with inbuilt SMART calibration that boosts the fuel efficiency without compromising on the performance. The mini truck can go at a maximum speed of 80 kmph and returns a mileage of around 21 kmpl. The Tata Ace Mega is made built on a strong chassis frame and rugged axle that can carry a lot of load. It looks a little similar to the Ashok Leyland Dost, its close competitor. Moreover, the half body gets a trendy and urban look. The mini truck has a day cabin and the cargo carriage deck is built on the chassis as standard. The cabin is not tiltable. The mini truck measures 3,835 mm in length. The gross vehicle weight is 2,100 kilograms, which makes for a good enough kerb weight and payload capacity. The overall kerb weight is 1,070 kilograms, while the payload capacity is 1,030 kilograms. The Tata Ace Mega features a tilt and telescopic power steering, which it can be adjusted up and down or towards and away, as the convenience and comfort of the driver. This customisable steering column makes the vehicle much easier to drive. The turning radius is very small (just 4.75 metres), which implies the ease of taking U-turn in a cramped area. The pickup truck has an off-road gradeability of 30%, which is pretty much on the decent side. This, along with the 175 mm ground clearance and the rigid axle configuration, make for an effortless drive on bad roads. It is suspended over Semi-Elliptical Leaf spring suspension on the front axle while the rear also gets the same. The Tata Ace Mega gets a combination of disc-drum brakes, which is different than its competitor, Ashok Leyland Dost, comes with. Though the vehicle is mostly used for city goods and cargo movement, ABS is not provided as an option. Speaking about the safety terms, the mini truck has seatbelts for the D+1 layout inside the cabin. It comes with parking brakes to park the vehicle on a sloping gradient or on the inclined bridge. Further, it gets Telematics inside the cabin, which helps it to deal with the long-distance and offers stolen-vehicle assistance. As mentioned before, the Tata Ace Mega has an urban design with sporty body graphics. The exterior gets the coloured bumper and wide angle ORVM (Outer Rear View Mirror) on both sides. The interior comes along with a centrally mounted Driver Console and an adjustable driver seat, which makes driving more convenient. There is also a provision for music system, mobile charger, both of which make the vehicle more trendy. The mini truck also gets tubeless tyres that make sure that there is less damage over time.